JBL announces Flip 3 Bluetooth portable speaker | What Hi-Fi? The Flip 3 builds upon the success of its predecessors, and now features a splashproof design, ideal for outdoor use. We loved the first JBL Flip speaker when we reviewed it back in 2013, but felt the follow up Flip 2 could have done with more low end weight. It seems JBL has taken that on board, as the Flip 3 comes with dual passive radiators, designed to give it “intense bass". A new cylindrical splashproof design, as well as a durable fabric casing - which looks similar to that on the UE Boom - means the speaker can be used outdoors, while multiple Flip 3 speakers can be connected together with a press of the JBL Connect button for a bigger sound. As is common with Bluetooth speakers, the Flip 3 can double up as a speakerphone and features echo and noise cancellation technology to improve call quality. Up to three smartphones can be connected at any one time and a built-in rechargeable Li-ion battery is said to offer up to 10 hours of playback time. 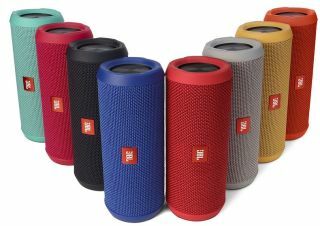 The JBL Flip 3 is available now in black, red, orange, pink, grey, blue, yellow and teal colours for £99.